Bitfinex is an exchange platform that offers margin trading of Bitcoin and other alternative Cryptocurrency markets (altcoins). It is one of the world's leading Bitcoin USD exchanges by volume. The platform allows trading participants to use third-party peer-to-peer financing from other participants on the platform to trade Digital Tokens. This enables users to buy or sell in a digital token market, without owning the token itself. Bitfinex also provides a lending (funding) market with daily interest payouts, suitable for individuals who do not trade and have lower risk appetite or prefer safer investments. 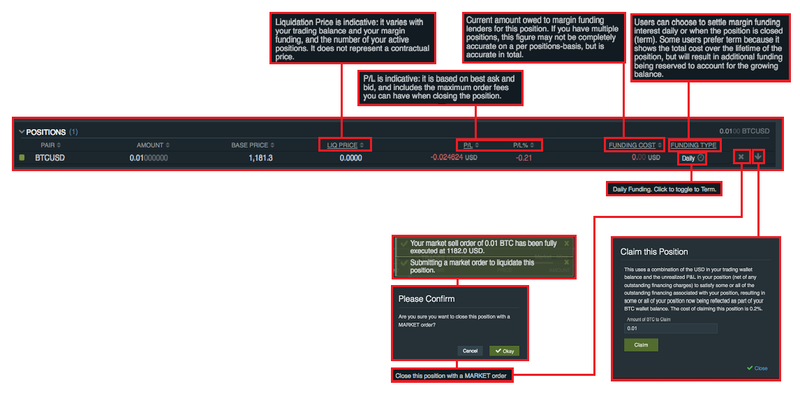 The platform's UI has changed significantly since 3 years ago and it's about time I updated my old Bitfinex guide. So let's get right to it. 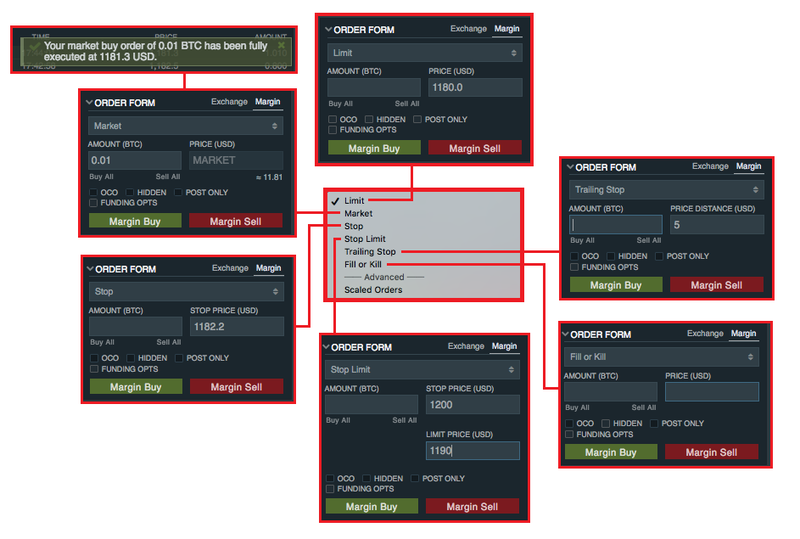 How does Margin Trading on Bitfinex work? Margin Trading refers to borrowing from the broker (trading platform) to either buy or sell a stock. This is made possible on Bitfinex by their Peer-to-peer Financing mechanism, as explained here: https://www.bitfinex.com/howitworks. 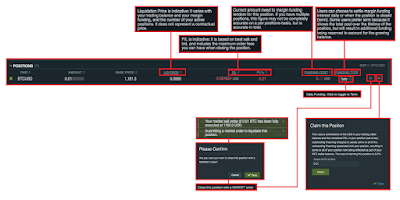 Bitfinex offers 3.3x leverage, meaning that for every $1.00 you have in your account, you can margin trade up to a sum of $3.30 across all available markets. The leverage offered here is fairly conservative, with other platforms offering 10x, 25x, or even 100x and up to 500x in some cases. By borrowing funds, you'll be subjected to interest charges which are automatically factored in when you close your position. 2. Margin Rules - Maintenance Margin (e.g. 15%) etc. If you are not careful (over-leveraged, position sizing too large, no stop loss, etc.) and a trade moves against your favour for too much and beyond your liquidation price, your whole account can get wiped out, or 'margin called'. Again I want to emphasize, if all this is new to you, make sure you understand the implications before getting started on margin trading. You'll only be able to see the above screen or landing page after logging into your account. So sign up for one, and fund your account to get started! Bitcoin deposits do not require any personal information or KYC and AML. Only fiat currency deposits and withdrawals do. With Bitcoin, fees and minimum withdrawals, deposits, and trades are negligible and opens up immense opportunity to trade without traditional restrictions. By using my referral code, you get to enjoy 10% off trading fees for 30 days! So here you go, EVERYONE is a winner, here is your link: https://www.bitfinex.com/?refcode=aQBHcxVPzj. Once logged in, you'll arrive at a neat trading dashboard that is user-friendly with easy-to-use tools to track the market, place positions, and manage those positions. You can click on the "Interface Settings" icon on the bottom left to change between Light and Dark theme. To start off, let me walk you through the different sections of the trading dashboard, before going into trading proper. Apart from Bitcoin, Bitfinex offers a variety of alternative cryptocurrency token markets for trading. Altcoin markets available for trading on Bitfinex today include Ethereum (ETH), Ethereum Classic (ETC), Zcash (ZEC), Litecoin (LTC), Monero (XMR), Bitfinex Token (BFX), and Recovery Right Token (RRT). Click on the three dots on the top left to access these alternative digital token markets. Once you fund your account, you'll be able to view your balance here. Bitfinex offers three types of trading, namely Exchange, Margin, and Funding. They each have separate wallets so you will need to transfer your funds to the relevant wallet by clicking on the "Transfer" button at the top right. As you can see in the picture above, my margin buying or selling balance is 3.3x of the actual amount I have in my account (across all wallets). Self-explanatory. Bitfinex's Charts are powered by the very robust TradingView engine, and offers a complete suite of tools and indicators you can tailor to your own trading needs. Self-explanatory. Shows the live order book and trades that occur on the platform in real time. 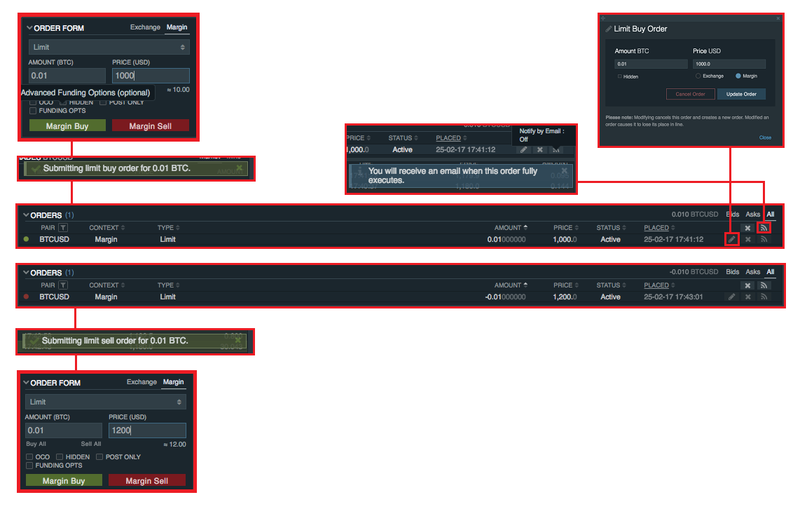 You can also view details of your recent trades by clicking on the "Mine" button at the top left of the "TRADES" box. Now that you have a good idea of how to navigate the trading dashboard, let's jump straight into the actual trading! In the Order Form section, you can create new trades (open a new order) here. Exchange trading refers to spot trading, where an actual transaction of BTC and USD take place and the asset in question changes hands. You can buy BTC with your USD, or you can sell your BTC into USD. Margin trading is where you don't have to actually own BTC to sell BTC, or own USD to buy BTC. With margin trading, you can go 'long' or 'short' on any market by using your leveraged funds. A market order executes a buy or sell at the nearest available price. A limit order is simply a buy or sell order at a price of your desire, and is usually placed under the market price for a buy and above the market price for a sell. A stop order is placed when you have an active position, in order to close your position when it goes in the opposite direction of where you intended it to, so as to minimize your losses. 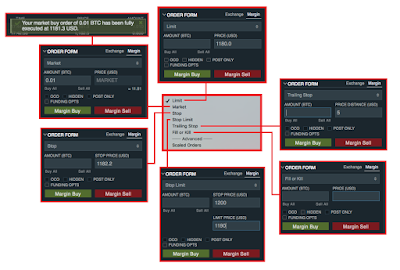 Read in detail about how these various order types work on Bitfinex in their FAQ. * Take note that Market Orders have no confirmation or warning messages. Once you enter the amount and click on buy/sell, the order is immediately executed. Beware the fat finger. The other 3 order types are rarely used, but are useful for some specific circumstances. For example, Stop Limit orders are especially useful for capitalizing on breakouts, and I will explain how we can do that later. Stop & Stop Limit, what's the difference? When should I use a trailing stop order? 1. One-Cancels-the-Other (OCO) - Allows to place both a take profit and stop loss target with cancels the other out once one is filled. 2. Hidden order aka Iceberg order - Hidden in order book, and always pay the taker fee. 3. Post Only - Ensures that your limit order does not match with an existing order, and always pay the maker fee. 4. Funding Options - Change some variables for how you borrow funds when you open margin positions, namely yes/no to including variable rate, and adjusting maximum margin rate (%/day). Scaled Orders enable a user to spread 1 order over several different positions in the order book. This is used so that the trader does not stick out like a sore thumb in the order book, especially for large amounts. For example, if a high net worth individual wanted to buy $1,000,000 worth of BTC at $1000 each, he may have to manually place 100 orders so each order is only worth a much less significant amount, in order to mask his true position from other traders. In fact, it is good practice to do this no matter how large an amount you are trading. Scaled orders allow a user to easily place such an order, by submitting the order only once and in a rather simple manner. As Poloniex puts it: The "scaled order" tool is an algorithm for creating multiple limit orders over a given price range. This allows traders to spend less time entering orders and more time focusing on their strategy. Lastly, after placing an order, you will be able to view and manage them from here. This is made up of three sections, namely open orders, open positions, as well as your order history. When you open a new order and it is immediately triggered (i.e. market order, or limit order buy for above market price), they will appear in the 'POSITIONS' section. When you have an open position, you can view the pair, amount, base price, liquidation price, current Profit/Loss, funding cost, funding type, and actions you can take include toggling the funding type (daily or term only), closing the position at market, and claiming the position. Here's a closer look at the 'POSITIONS' section. When you open a new order but it has not yet been triggered, they will appear in the 'ORDERS' section. When you have an open order, you can view the pair, context (exchange or margin), order type, amount, price, status, date & time placed, and actions you can take include editing the amount or price or context or hidden option, cancelling the order, and opting to receive email notifications when an order fully executes. Here's a closer look at there 'ORDERS' section, and how it ties in with the 'ORDER FORM' section. Limit orders are effective for opening a position, but they’re problematic for exiting a position. For example, if you need to exit your position because the breakout has failed, you simply need to exit the position without trying to finesse the price. Failed trades recover infrequently, and they often get worse. You have no reason to be patient when things are going against you. Read more about how to use limit, stop, and stop limit orders here: How to Devise an Effective Order-Entry Strategy in Trading. When placing a stop order, your limit price may be higher or lower than your trigger price. This effectively allows you to do two things; have a limit order be placed when your trigger price hits, or market buy (by placing limit order above trigger price) when your trigger price hits. The first thing that comes to mind about stop orders is that it is used to 'stop out' of a losing trade when price goes against you beyond a set threshold. Yes, Stop & Stop limit orders are especially good for exiting positions when they go against you. However, some of you may not know that stop orders can also be highly effective for opening a position, particularly to enter markets on breakouts. If you identify the stock that you want prior to an actual breakout, you can enter a buy stop at a price above the breakout point. Although it is generally recommended that you wait a few days to confirm the breakout, using this strategy at times may be more appropriate than others. However, you need to be much more tentative when the market is only in a bullish transition or pullback phase, or when you’re monitoring second and subsequent breakouts. When that’s the case, make sure the breakout is confirmed — that means the stock remains above its breakout price for a bullish breakout — within a few days before entering your order. If you have any doubt, wait for confirmation. "Cut Your Losses and Let Your Winners Ride"
Have you ever heard of this phrase? This popular trading quote is best embodied by the use of a (trailing) stop loss for profit taking. When your position is in profit, employing a trailing stop loss will allow you to ride your winner, while protecting your profits by closing your position if the market moves x pips in the opposite direction. Read more about how to use stop and trailing stop orders effectively here: Trailing-Stop/Stop-Loss Combo Leads to Winning Trades. However, when it comes to stop losses, it is important to note that there is no guarantee you will receive the price of your stop loss order. If the stock price drops quickly, your order may not get filled at your predetermined stop price. Thus, you may be forced to sell at a lower price than you expected. This is particularly true with illiquid stocks or in fast-moving markets. Bitfinex has an iOS and Android app, giving you the option to watch markets, monitor and make trades while on the move, ensuring you never miss another Bitcoin move. Their API also offers an easy and efficient way to build digital asset trading applications and tools, trading bots, and more! If you would like to find out more, visit Bitfinex's support portal knowledge base, and reach out to their support team if you need any assistance. 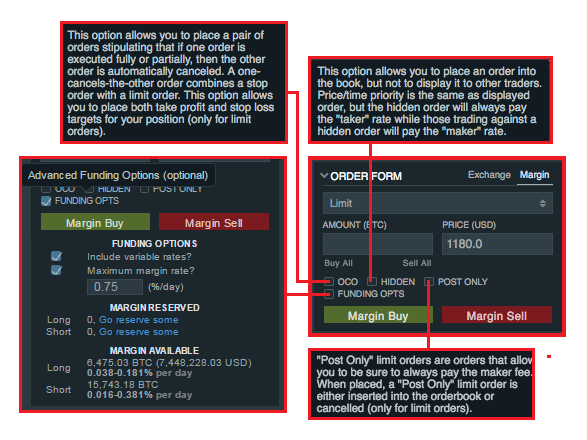 I hope that this tutorial helps you to understand better how Margin and Leveraged Trading works, and especially how it applies on Bitfinex. 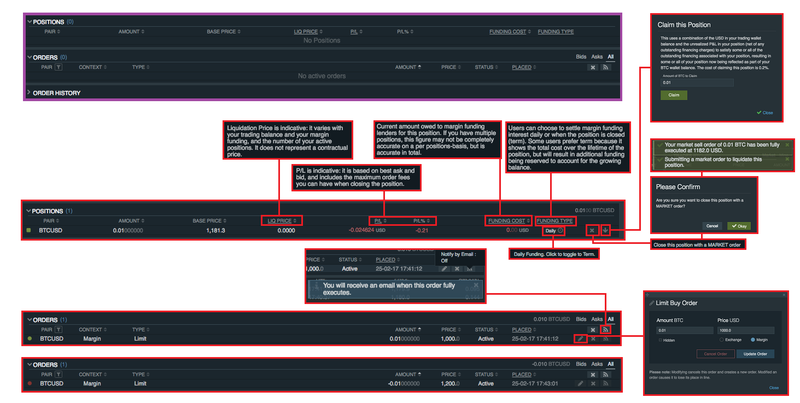 It also gives you an idea of when to employ what type of order and how to execute it, and I trust that this is able to takes you one step further in developing your winning trading strategy! If you haven't already created a Bitfinex account by now, sign up with this link and get to enjoy 10% off trading fees for the next 30 days: https://www.bitfinex.com/?refcode=aQBHcxVPzj. In my next posts, I will be writing similar tutorials for other Bitcoin exchanges such as BitMEX and 1Broker. If you have any suggestions, feel free to leave a comment below.